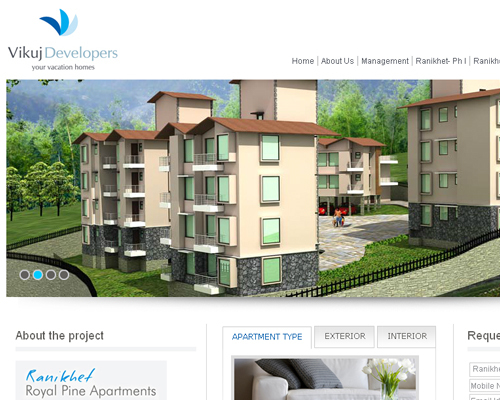 How to Design a Dynamic Website for a Real Estate Company? WebGuru India has recently developed a website for Vikuj Developers, a real estate business company, that sells real estate properties in Ranikhet and Goa, helping people buy their dream home at an affordable price. Flash Banner– The Flash banner on the homepage makes the site visually appealing. It gives a glimpse of the apartments and surrounding nature to increase conversion rate. The banner is designed like a slide-show while few animation effects have been used to keep it lightweight and SEO-friendly. Google Maps Integration– Google Maps is embedded in the “contact us” page to make the site user-friendly. Visitors can not only check the location of Vikuj’s head office, but can also get route directions directly from the map. Call Back Form– The “request a call back” form is there in all the web pages to help buyers contact vendors easily. The form is placed above the fold area to capture visitors’ attention. A very interesting article to read about dynamic web development.Thanks a lot for posting this.Good Work.Keep it Up.